In 1998, the Friends of the Longfellow House published the first-ever edition of Charles Appleton Longfellow’s diary of his voyage to Japan. Oldest son of Henry W. and Fanny Longfellow and a Union Army veteran, Charley Longfellow was among the earliest American tourists in Japan. His journal therefore offers a rare picture of the Asian nation opening up to the world after centuries of isolation. Charles Appleton Longfellow arrived in Japan on June 25, 1871, three years after the restoration of imperial rule. He planned to stay for only a few months, but became so fascinated that he remained for more than a year and a half. Longfellow accompanied the U.S. Minister to Japan to audiences with the young Emperor Meiji and on expeditions through the Ainu country to Hokkaido and from Hakodate to Tokyo. Their party were the first Americans to travel much of this route. Longfellow’s lively and sympathetic description show how early modern Japan impressed him. Charles Appleton Longfellow’s writings remained virtually unknown for over a century, unpublished and stored with other family papers at the Longfellow House. Dr. Christine Wallace Laidlaw edited his Japan diary for this book and added a fine introduction. The book includes some fifty photographs that Longfellow brought back from Asia, many published here for the first time. 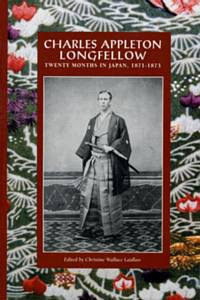 The first printing of Charles Appleton Longfellow: Twenty Months in Japan has sold out. We are currently considering a second edition. The Friends are grateful to the late Dr. Christine Wallace Laidlaw for her dedicated work on this book.